Top: A Corned Beef & Cabbage panini sandwich from Dietz & Watson. Bottom: Sliced corned beef. Photo courtesy Cascal Soda. 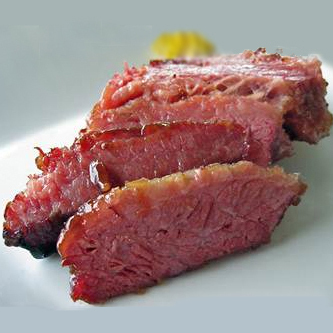 You may look forward to Corned Beef & Cabbage on St. Patrick’s Day? How about a Corned Beef & Cabbage Sandwich? 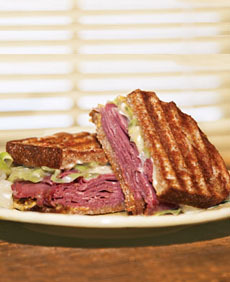 If it sounds strange, remember that cole slaw is simply sliced cabbage with dressing, and that the Reuben is a grilled or toasted sandwich on rye or pumpernickel with corned beef, sauerkraut, Swiss cheese and Russian Dressing. In this recipe from Dietz & Watson, they cabbage is simply steamed, but nothing’s stopping you from serving the sandwich with a side of slaw. Or a cold beer. This photo shows the sandwich made on a panini press, but you can make a conventional sandwich as you prefer. In addition to corned beef hash, this is one of our favorite uses for leftover corned beef. 1. BRING 1/4 cup of water and 1 tablespoon oil to a boil in a medium pot over high heat. Add the cabbage and reduce the heat to low. Steam the cabbage for 15 minutes but do not overcook; the cabbage should still remain crisp. Drain and pat with paper towels to remove excess moisture. Season with salt and pepper to taste. 2. LAY two slices of bread on a flat work surface. Spread 1 teaspoon of mustard on each slice. Pile the corned beef, Cheddar and cabbage on one slice. Add the top slice of bread. Grill on a panini press or serve as is.